For suppressive treatment and for acute attacks of malaria, we are offering best quality of Yashiquin Tablet. This is known for its effective results in short period of time. It contain chloroquine phosphate is a 4-aminoquinoline compound and chemically it is 7-chloro-4-[[4-(diethylamino)-1-methylbutyl]amino] quinoline phosphate (1:2). These are available in safe packaging and kept in cool area to maintain their longer shelf life. These are safe to consume but in limited doses that a person can take after consulting the doctor. Each film coated tablet contains: chloroquine phosphate BP 250 mg eq. to chloroquine base 150 mg, excipients Q S, Approved colour used. Chloroquine phosphate tablets are indicated for suppressive treatment and for acute attacks of malaria due to P. vivax, P. malariae, P. ovale and susceptible strains of P. falciparum. The drug is also indicated for the treatment of extraintestinal amebiasis. The dosage of chloroquine phosphate is often expressed in terms of equivalent chloroquine base. 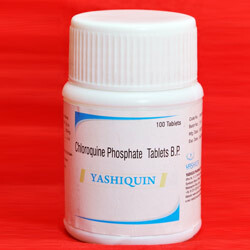 Each 250 mg tablet of chloroquine phosphate is equivalent to 150 mg base. Adult Dose: 500 mg (= 300 mg base) on exactly the same day of each week. If circumstances permit, suppressive therapy should begin two weeks prior to exposure. The suppressive therapy should be continued for eight weeks after leaving the endemic area. Adults: An initial dose of 1 g (= 600 mg base) followed by an additional 500 mg (= 300 mg base) after six to eight hours and a single dose of 500 mg (= 300 mg base) on each of two consecutive days. This represents a total dose of 2.5 g chloroquine phosphate of 1.5 g base in three days. First dose: 10 mg base/kg (but not exceeding a single dose of 600 mg base). Second dose: (6 hours after first dose) 5 mg base/kg (but not exceeding a single dose of 300 mg base). Third dose: (24 hours after first dose) 5 mg base/kg. Fourth dose: (36 hours after first dose) 5 mg base/kg. Adults: 1 g (600 mg base) daily for two days, followed by 500 mg (300 mg base) daily for at least two to three weeks. Treatment is usually combined with an effective intestinal amebicide. Chloroquine is rapidly and almost completely absorbed from the gastrointestinal tract, and only a small proportion of the administered dose is found in the stools. Chloroquine is an antimalarial agent. While the drug can inhibit certain enzymes, its effect is believed to result, at least in part from its interaction with DNA. However, the mechanism of plasmodicidal action of chloroquine is not completely certain. Chloroquine is active against the erthyrocytic forms of Plasmodium vivax, Plasmodium malariae and susceptible strains of Plasmodium falciparum (but not the gametocytes of P. falciparum). It is not effective against exo-erythrocytic forms of the parasite. Adverse effects of Chloroquine Phosphate may include: Irreversible retinal damages, visual disturbances like blurring of vision and difficulty of focusing or accommodation, nyctalopia, difficulty in reading with words tending to disappear, seeing half an object, misty vision and fog before the eyes, reversible corneal opacities, nerve type deafness, tinnitus, reduced hearing in patients with pre-existing auditory damage, skeletal muscle myopathy or neuromyopathy, depression of tendon reflexes and abnormal nerve conduction, hepatitis, anorexia, nausea, vomiting, diarrhea, abdominal cramps, erythema multiforme, Stevens-Johnson Syndrome, toxic epidermal necrolysis, exfoliative dermatitis, Pleomorphic skin eruptions, skin and mucosal pigmentary changes; lichen planus-like eruptions, pruritus, urticaria, angioedema, photosensitivity and hair loss and bleaching of hair pigment, pancytopenia, aplastic anemia, reversible agranulocytosis, thrombocytopenia and neutropenia, convulsive seizures, mild and transient headache, polyneuritis, psychosis, delirium, anxiety, agitation, insomnia, confusion, hallucinations, personality changes, hypotension, electrocardiographic changes and cardiomyopathy. Chloroquine should not be used for treatment of P. falciparum infections acquired in areas of chloroquine resistance or malaria occurring in patients where chloroquine prophylaxis has failed. Long-term or high-dosage 4-aminoquinoline therapy can cause irreversible retinal damages, muscular weakness. All patients on long-term therapy with this preparation should be questioned and examined periodically, including testing knee and ankle reflexes, to detect any evidence of muscular weakness. If weakness occurs, discontinue the drug. Use of Yashiquin tablets in patients with psoriasis should not be used unless in the judgment of the physician the benefit to the patient outweighs the potential risks. Usage of chloroquine during pregnancy should be avoided except in the suppression or treatment of malaria when in the judgment of the physician the benefit outweighs the potential risk to the fetus. Patients with prolonged therapy - complete blood cell counts should be made periodically. If any severe blood disorder appears which is not attributable to the disease under treatment, discontinuance of the drug should be considered. Patients having G-6-PD (glucose-6 phosphate dehydrogenase) deficiency. Patients with preexisting auditory damage- In case of any defects in hearing, chloroquine should be immediately discontinued, and the patients closely observed. Patients with hepatic disease or alcoholism or in conjunction with known hepatotoxic drugs. Patients with a history of epilepsy should be advised about the risk of chloroquine provoking seizures. Concomitant use of cimetidine should be avoided. Use of this drug is contraindicated in the presence of retinal or visual field changes either attributable to 4-aminoquinoline compounds or to any other etiology, and in patients with known hypersensitivity to 4- aminoquinoline compounds. However, in the treatment of acute attacks of malaria caused by susceptible strains of plasmodia, the physician may elect to use this drug after carefully weighing the possible benefits and risks to the patient. Chloroquine is very rapidly and completely absorbed after ingestion. Toxic doses of chloroquine can be fatal. As little as 1 g may be fatal in children. Toxic symptoms can occur within minutes. These consist of headache, drowsiness, visual disturbances, nausea and vomiting, cardiovascular collapse, shock and convulsions followed by sudden and early respiratory and cardiac arrest, hypokalemia. Treatment for overdose is symptomatic and must be prompt with immediate evacuation of the stomach by emesis (at home, before transportation to the hospital) or gastric lavage until the stomach is completely emptied. If finely powdered, activated charcoal is introduced by stomach tube, after lavage, and within 30 minutes after ingestion of the antimalarial, it may inhibit further intestinal absorption of the drug. To be effective, the dose of activated charcoal should be at least five times the estimated dose of chloroquine ingested. 100 white coloured, round shaped tablets packed in plastic bottle in monocarton along with leaflet. Keep in cool, dry dark place.